Formula: 15 – 3 – 6 Plus Iron and Sulfur (also contains Zinc, Copper, Calcium and Manganese). Pro-Rich Professional Formula Winterizer supplies the university recommended 1 pound of nitrogen per 1,000 square feet. Pro-Rich Professional Formula Winterizer is made in Colorado and is designed for use in the western United States. Pro-Rich Professional Formula Winterizer is unique in its offering with its organic base. Pro-Rich Professional Formula Winterizer is organic based with DPW (Dehydrated Poultry Waste). For best results apply Pro Rich Professional Formula Winterizer from late September – late November. If desired, more than one application may be made. After applying Pro-Rich Professional Formula Winterizer, water normally. Pro-Rich Professional Formula Winterizer is in a class by itself because of its unique organic content, DPW (Dehydrated Poultry Waste). The DPW contains trace elements and micro-nutrients not found in conventional chemical fertilizers, which are slowly released over the entire growing season. Pro-Rich Professional Formula Winterizer promotes a deeper, stronger root system, thereby inhibiting weed growth and improving disease resistance. When Pro-Rich Fertilizers are used on a regular basis, hard clay or sandy soils benefit from improved soil texture, thus promoting deeper root penetration and helping reduce watering requirements. 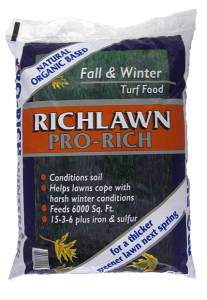 Pro-Rich is the fertilizer for all seasons. The longer Pro-Rich Professional Formula Winterizer is used on your lawn, the better it will perform. Due to its organic base, millions of microbes are present in your soil, improving its physical characteristics, and making a better foundation for root growth, which will improve the overall condition and appearance of your lawn.